Sooo, I've got the paint picked out for the half bath downstairs. I just need to find my motivation to get started and pick up supplies. Hunh. Sometimes I put off larger projects by doing smaller, easier ones. Well, here's a good example. Most of us have a few of these hanging around the garage or basement. Real beauties, I tell you what! Did you know that's quite the easy fix? I had seen a picture on Pinterest that linked back to a Flickr feed. So it wasn't even a DIY thing...it was a photo of a bunch of chairs at some cafe in Europe. I thought to myself: Self, this is a great idea! I had two like the one pictured above with the cushion. I primered the cushion really well with the Rustoleum primer. Let it dry for at least 24 hours...good to go! The rest, I just wiped clean and started spraying. I learned some things about spray paint. It is NOT all created equal. I never could find a LIGHT orange so I ended up with two pinks. However, I tried three different kinds...wanna know my opinion? over spray dust - the whole garage was coated...along with my feet! The Rustoleum I used was okay...but still quite a bit of dust. The Krylon covered well and had the least amount of over spray. Oh, and with two coats for each chair...I used one can per chair. that I haven't gotten around to posting yet. Here they are leaning against the house on the deck. This deck...but that's a story for another day. 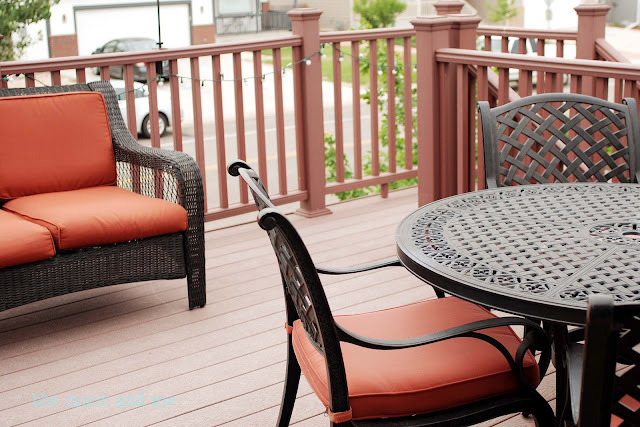 I really like the difference it made on the appearance of these chairs. Now they're so much more fun! 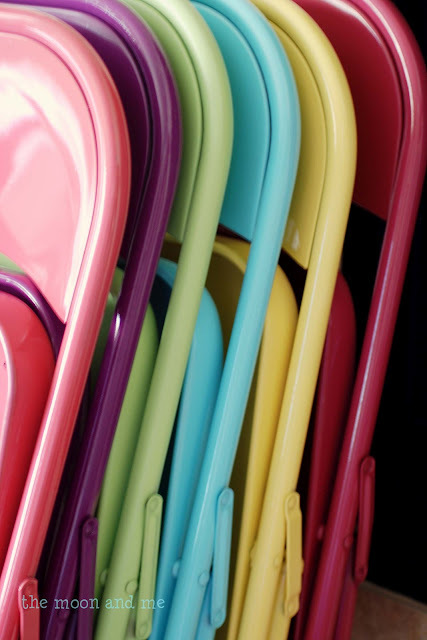 Do you have any metal folding chairs sitting around that need a face lift? See this post featured at Chickabug! I've had several questions about priming and sealing. I did NOT prime the chairs themselves. I only primed the vinyl cushions. they are still holding up well. I will let you know if that changes. I might suggest spraying them with a top sealer just to extend the paint life. Paint gets scratched...especially on stuff like this. But it should be an easy fix...just touch up with a few spritzes. I love this! 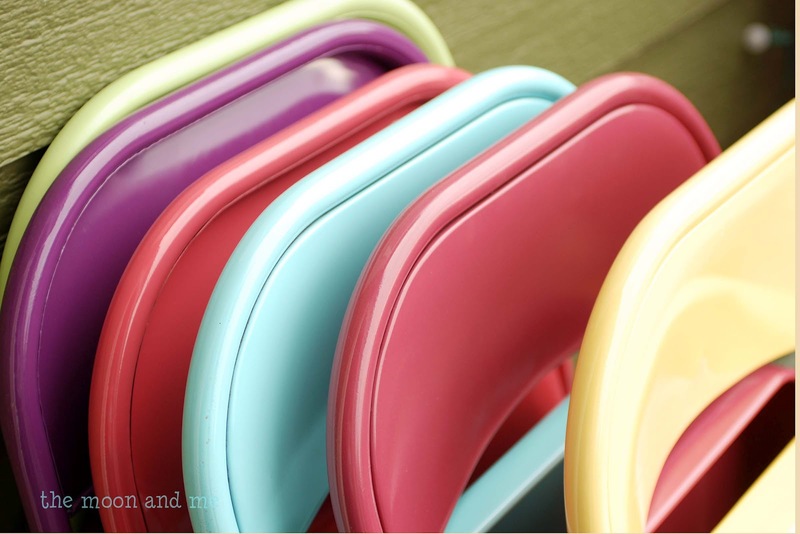 Fun colors makes everything so cheerful! Great idea. May have to try that one of these days. I am featuring you tomorrow on my blog... I love your chairs! Thank you so much for linking up to The 36th AVENUE. pretty much brilliant. great job. Wow, So simple and SO cute! Hey, I am wondering, how are they holding up. I know these chairs are subject to a lot of bumping/scratching. 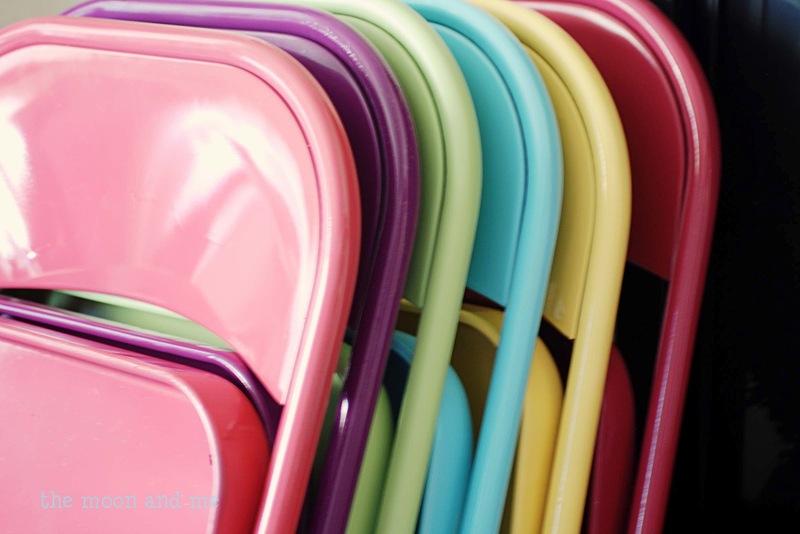 Love your chairs! Can you tell us the names of the spray paint you used? Thanks! Hi Christine. I also replied to you in email form but thought I'd answer here in case anyone else was curious. The purple, pinks and aqua were Krylon: Rich Plum, Watermelon, Raspberry and Blue Ocean Breeze. Yellow was Rustoleum - I'm also not sure about this one but probably Summer Squash. If they are different than that, I will let you know! The green was right...but the yellow is "warm yellow"
Those are really beautiful, and I never thought I'd say that about metal chairs! Love those colors, so happy and pretty at the same time. Are your chairs staying painted or are they scratching up easily? Love these and I want to do it to my black ones someday. PS I love your deck furniture. What a great idea. You've turned something so boring and utilitarian into something fun and still useful! And what a great way to ensure that YOUR chairs make it back to you. I'm always lending mine out and never get them back! Hey Cutie!! 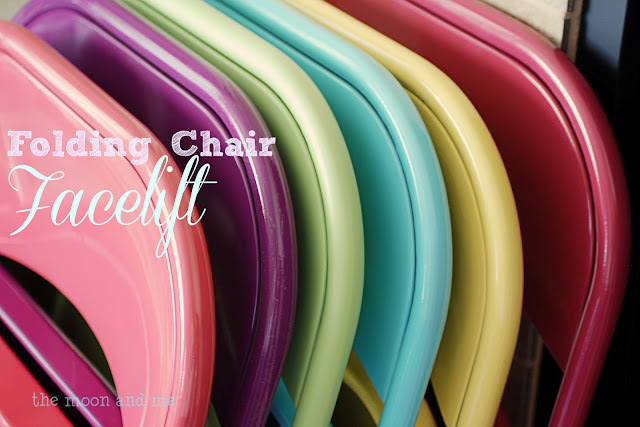 LOVE this new look for your chairs!! LOVE it!! i made a rainbow with chairs i spray painted, very easy way to make a impact outside. This is a really great idea. Did you coat with anything? Do you think the spray paint is going to chip with use? Found you via Serenity you. What a great idea! These look amazing. I love spray paint and I really really love the colors you used. So super cute! They look a million times better! I have never cared for Valspar because I have had the same issue. I have never given any thought to spray painting mine. They look great! I could see these at an outdoor spring wedding, or a high school graduation, or baby shower...they add so much! Thanks for sharing this! I recently primed and painted some small metal chairs. They looked wonderful, but they started chipping right away. What did I do wrong? I used a cheap primer, but finished with Krylon. I'm bummed that I need to do them over again, but I need some advice on how to get them to be more durable. If anyone has any ideas, please email me mypatzer@yahoo.com. Thanks! I only primed the vinyl cushions...and these haven't had heavy use just yet. But perhaps a top coat sealer? Hi! I shared your cute chairs on Friday Finds today. Thanks! Did you have to spray any kind of sealer or coating after the paint? What a great idea! Do you have to prime them first? And how are they holding up? Do they chip? This is awesome! Thanks for the inspiration. These look great! I'm going to pin this so I remember your two cents when I get to this project! Krylon...good know! These look amazing!! What a fun folding chair transformation! Love how colorful ... and Krylon loves the praise you've given them! Such a pretty transformation - and what fun colors you chose. Thanks so much for sharing at our link party. Thanks for sharing. I'm going to get the kyrlon paint to fix my ugly chair, and I'll also be redoing my daughter's old Dora folded chair with the fabric on it. I'll be spraying that one a different color to match the new fabric I'll be putting on. Thanks for the inspiration and the information! Wonderful project and they definitely look a whole lot better! I love the way they came out...and agree with one of the comments here - they went from ho hum to awesome! Great job. This is great, but one problem I ran into is it was hard to coat the chair evenly so I ended up with a lot of drippy spots with too much spray paint. How did you avoid this issue? I had this problem a little on the backs...mainly because I was impatient. :) The backs are slightly slanted. I was trying to put the paint on too heavy. It really does take nice even coats. I have other spray paint projects with bad drips because I get heavy handed. I usuallly am able to cover it up with more paint...evenly applied. I suppose you could sand the drips a little before applying more paint. Holy smokes! Those are too cute! Visiting you back and now following! I LOVE IT!! Those are the most fun, super cute chairs. I need to go find me some chairs to spray paint...maybe I will talk my Mom in to it since she has a bunch of them. :) Did you have to do anything to protect the paint from scratching or chipping or are they good to go? Wow they look awesome! I just have one question...did you notice any problem with the hinges after they have been painted? Do they stick? I really want to try this! Thanks! I'm doing mine before our rummage sale next month! I absolutely love this idea. 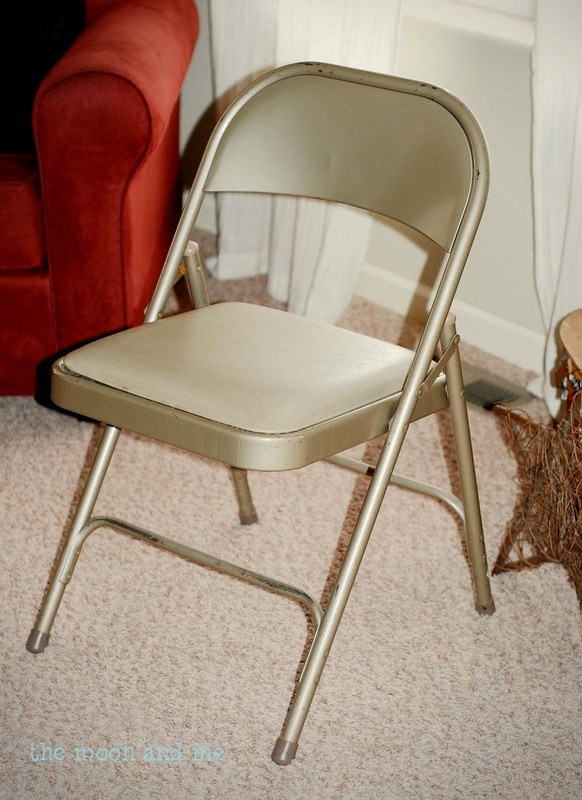 I host a lot of parties and chairs have thrown of the theme sometimes. This is a perfect solution! I love this idea. Thank you so much! The chairs at the local thrift shop are $1! I just made some of these for my craft booth at a farmer's market. They take a LOT of paint!! as you said, 1 can per chair! I had 20 chairs, so it looked like I was going to go tagging when I bought them. I love those chairs - not just your average folding chair :)) Love the colors. I am putting it on my to do list. Thanks for sharing. I am so excited I found your blog. I was just getting ready to move my grandmother's metal table and chairs to my girls' playroom for scrapbooking. Awesome idea for creativity and color. I cannot wait to get started! Thank you for sharing! How simple. How clever. Love, love, LOVE this. hey ! lovely chairs , Thanks for sharing this post. 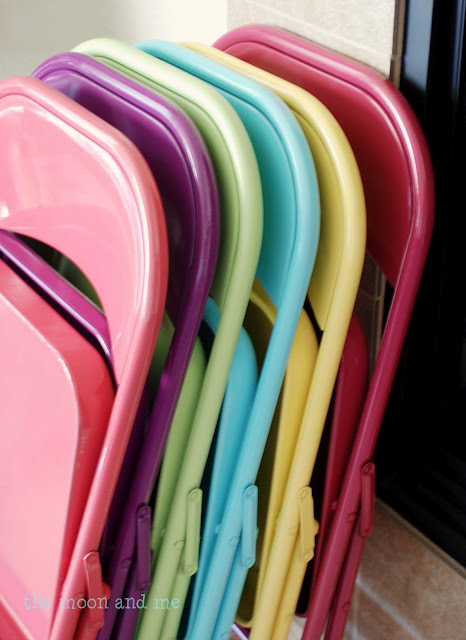 I love the different colors painted on folding chairs and it is looking so nice and attractive that every kid will be glad to watch, I like it. What a great idea! I so need to do this! I'd love to know how these have held up over the last year! I do have a set of 4 in my garage with a table! Hummmmmm, thanks for the great idea and tip on Krylon paint. I was thinking about doing this to my shopping cart in pink (lol DONT JUDGE) but is there a glitter spray we can use also that is like spray paint? I figure if im going to go food shopping it might as well be fun! I know Krylon has a couple different glitter spray paints in different colors. It just depends on how much glitter you actually want. I love your chair you did a great job. 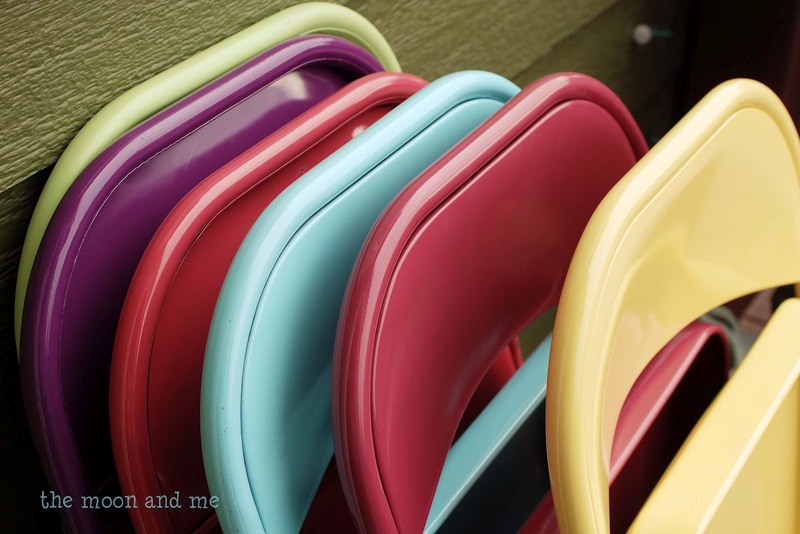 I have to repaint some of my old metal chairs for the yard and I will try Krylon. I'm wondering how the paint has held up over time? Any chips or scratches? Which kind of Krylon did you use? I see quite a few for metal. So excited to try this, thanks for sharing. I'm having a cookout this weekend and was not happy about my ugly chairs. Krylon spray paint now comes with the primer in it. I'm wanting to do this with my old childhood metal table and chairs. Did you do anything special to prep the folding mechanism or just spray paint right over it? Thanks! What do I think? Ingenious! Gorgeous! A Wagon is the Storage Basket is the perfect space saving alternative to a large can have a bulky wagon. Love it! You can also get a cheap (but pretty) vinyl tablecloth to recover the chair seats and table. It's easy and can be changed out if you get tired of it. Maybe a spray sealer would probably work well on the chair? Going to have to do this with mine! Unsure about the cushions. You mentioned you sprayed them with a yellow Rustrolium Primer. How did you keep it off the rest of the chair? Or did you do the cushion first and not worry. Then just went over any yellow that happened to have got on the chair part. why Rustrolium on the cushion? To help the color attach and stay on? The primer was applied first...and it was white. Primer acts to help the paint adhere to any surface so it is sprayed first...then dries...then the final color is sprayed on the ENTIRE chair and covers all the primer. This is a very good article, since it helps people to make their website better!